Would you go to prom with me?? Excited to announce the first formal event for Kindleigh and the Kindness Community! 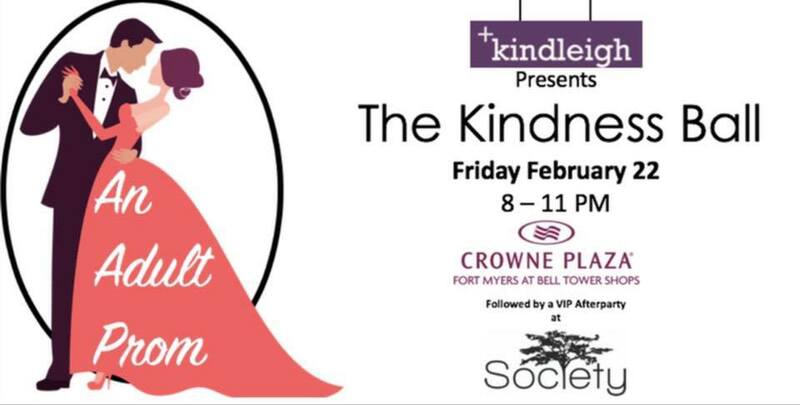 Our first annual Kindness Ball (An Adult Prom) will take place on Friday February 22 from 8-11p at Crowne Plaza Fort Myers At Bell Tower Shops! Join Us For a Fun Evening of Drinks, Appetizers and Dancing while we support The Kindleigh Foundation for Random Acts of Kindness as well as Other Local Organizations! There will be open bar, passed appetizers and a great DJ so you can dance the night away in your formal best! Early Purchase Discounts Available Now - But Hurry as Tickets are Limited! Bring your friends! Prom is best when you have an entourage! Stay tuned for details on who is eligible to become Prom King and Prom Queen as well! We've just announced a very special VIP After Party at Society (also located in The Bell Tower Shops). Join us for a truly epic evening centered on spreading kindness!